This website is about reversing "heart disease". Reversing heart disease is not only possible, it is likely. Heart attack and stroke are the leading killers, but not because science has failed. On the contrary, medical pioneers long ago uncovered the cause of cardiovascular disease, aka "heart disease." It is hardly known that Linus Pauling, arguably the greatest scientist of all time, invented a rapid, nontoxic cure for the condition. Fortunately, this claim was made on video and was patented. This means that Cardiology should not exist. An entire profession, and its arsenal of toxic drugs, are based on lies and misguided "science." So, why you ask, isn't this knowledge made public? Well, heart disease generates (one might say costs the economy) more than $300 billion every year. So far Pauling's claim, is dismissed a priori by medicine without comment or critique. On this page are links to vast amounts of information, both scientific and anecdotal. 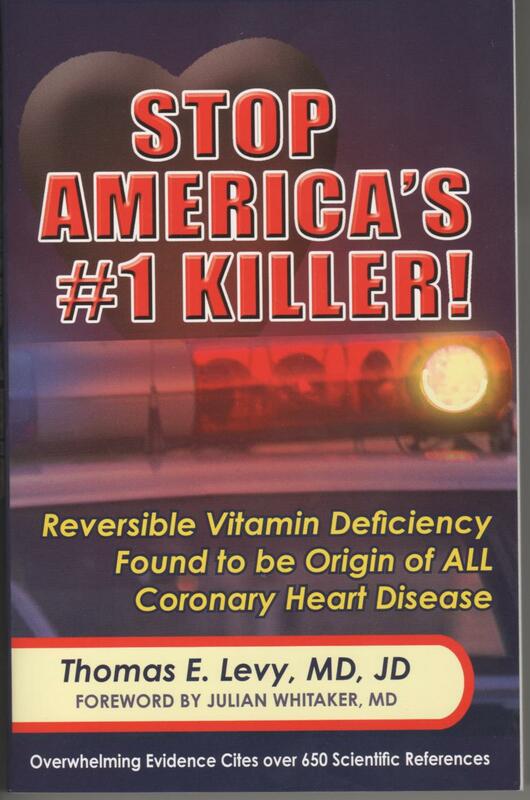 This information has been swelling like a tumor since Pauling first claimed the cure for heart disease on video. The medical profession, which could surgically excise this tumor with a study or two, has instead adopted a "head in the sand" stance, hoping the growth is benign, afraid of what the biopsy might show. Medical training and most of the literature fed to the medical profession is funded by pharmaceutical interests, which explains why medicine still can not quote even one study that refutes Pauling. The reasons you - and your doctor - haven't heard about Pauling's theories and the cure for heart disease, are the same reasons that film producer Aaron Russo made his chilling documentary AMERICA: FROM FREEDOM TO FASCISM. Earn money by spreading the word on your web site! If you want to join the Russo DVD affiliate program, please use "ofonorow" as the referring affiliate username. Thank you. Watch the Entire Aaron Russo Film on Google Video - Free! Ten-year experience shows Pauling Therapy is effective, and safe as long as vitamin C is increased. Bizzaro World: No published clinical studies!? Heart Technology (high dosage vitamin C/lysine/proline) is working well for my mother and I don't want her to run out. Her Cholesterol was over 500 a month ago, severe blockage and has had by-pass surgery and carotid surgery twice. She went in for her checkup the end of last week and her cholesterol is now down to 183 and the rest of the tests were normal. They even cut the dosages on some of her medicines. She will be going back in a month to follow-up and see if the numbers stay there. I don't know if the product did all of that in a month but it didn't hurt either. She has been cooking and cleaning again for the last two weeks which she hasn't been able to do in over a year. So you can see why I don't want it to run out. "Serendipitously, ... it was noticed that those patients taking supplemental vitamin C were showing reductions of retinal arterial cholesterol, typically seen at stressed points e.g. bifurcations. B) Pauling's high vitamin C/lysine therapy works quickly and safely. C) In fact, there is a 10-year history of reversals in those following Pauling's advice given on his Unified Theory video. D) Every heart patient should be informed, however, this "too fantastic" news has never been published in a medical journal, major news outlet or daily newspaper. "This treatment, at the correct high therapeutic dosage, produces palpable, large beneficial effects. With the new LifeStream Home Cholesterol Monitor, people can now monitor this effect on their cholesterol. A strong effect which occurs in short days." - Owen R. Fonorow and M. S. Till, Sr. FACT: The leading cause of death in the United States, the condition that modern medicine calls heart disease, or occlusive cardiovascular disease, is a chronic form of scurvy. Chronic Scurvy: Heart disease is a misnomer, the underlying disease process reduces the supply of blood to the heart and other organs leading to angina ("heart cramp"), heart attack and stroke. The disease process is characterized by scab-like build-ups that grow on the walls of blood vessels. The correct terminology for this disease process is chronic scurvy, a slower form of the classic vitamin C deficiency disease. FACT: The First Fact was confirmed by the world's leading scientist, Linus Pauling. Pauling made this claim after experimental science (even experimental proof) verified his theory. If your cardiologist, or anyone else, were to challenge Fact One, they must be able to cite scientific experiments designed to test (refute) the Pauling/Willis chronic scurvy hypothesis. Disconfirming experiments have never been published as documented by Pharmacology professors Steve Hickey and Hilary Roberts in their recent book ASCORBATE: The Science of Vitamin C (2004). FACT: A new diagnostic technique CardioRetinometry can be run by any eye doctor and easily confirms Fact One. Case Report: Bad EKG 'Now Normal' on Pauling Therapy. Case Report: High vitamin-C Lowers (LDL) Cholesterol more than statin drugs. The story of the science and cure, as told by Pauling himself, is on video. End-stage CVD patients report the cessation of their angina pain, return of normal skin color, lower blood pressure, more blood flow, disappearances of blockages, drop in heart rates, normalization of lipid profiles, increase in both energy and the sense of well being. From the beginning, the Pauling therapy began curing the incurable. Miracle after miracle. Yet not a single media outlet would print even a single story. We continue to receive amazing reports. Proper dosage and duration is apparently the key to a fast acting, and long-term successful cure. At the recommended therapeutic dosage, the oral Pauling Therapy works for many people to relieve pain in days. Over time, lower maintenance doses must then be continued for life. "Although physicians, as part of their training, are taught that the dosage of a drug that is prescribed for the patient must be very carefully determined and controlled, they seem to have difficulty in remembering that the same principle applies to the vitamins." Linus Pauling HOW TO LIVE LONGER AND FEEL BETTER, pg 142 paperback. Heart patients on the Pauling therapy consistently report amazing results. VITAMIN C AND HEART DISEASE: OWEN'S RADIO INTERVIEW... (May 2003, RealPlayer) and THE CURE FOR HEART DISEASE article (2004) and MY LIFE IN THE TWILIGHT ZONE article. CONCLUSIONS: The results suggest a reduced incidence of major CHD events at high supplemental vitamin C intakes. The risk reductions at high vitamin E or carotenoid intakes appear small. "FINDINGS: Strong inverse relationship for blood ascorbate (vitamin-C) concentrations with all-cause and cardiovascular disease mortality, which were only marginally reduced after adjustment for confounders or supplement use. Those in the lowest fifth (< 17 micromol/L) had the highest mortality, whereas those in the highest fifth (> 66 micromol/L) had a mortality risk nearly half that (hazard ratio = 0.54; 95% CI: 0.34, 0.84). Similar results were found after the exclusion of those subjects with cardiovascular disease or cancer at baseline (hazard ratio = 0.51; 0.28, 0.93). In fully adjusted models, there was no evidence for an influence of alpha-tocopherol (vitamin-E), beta-carotene, or retinol (vitamin-A) on total mortality. Dietary antioxidants measured by the food-frequency questionnaire were not associated with all-cause or cardiovascular disease mortality"
15-YEAR HARVARD STUDY OF 85,000 FINDS SINGLE VITAMIN C PILL REDUCES HEART DISEASE ALMOST 30%. Interestingly, dietary intake of vitamin C seemed to have little effect on coronary heart disease risk. But if women used vitamin C supplements, their risk was reduced by 27 percent. According to the numbers in [this story] A single 360 mg vitamin C pill daily would save more than 300,000 lives per year. FIRST LONG-TERM STUDY IN HUMANS FROM UNITED KINGDOM? Why haven't you heard about Pauling's Claims? If this has not been suppressed, why haven't you heard? Perhaps Linus Pauling was wrong? Why would the media resist reporting what Pauling merely said? Instead, the silence is deafening. Millions of people are dying needlessly if Pauling and Rath are right. The crime is that we don't know! Pauling and Rath did their part, the rest is up to medical science. But medical science is apparently under the thumb of the drug industry. Even the U. S. National Institutes of Health has turned down studies of the Pauling therapy! "If the claims for vitamin C are correct, it might replace many lucrative and expensive medications. As they researched their book ASCORBATE, Hickey and Roberts began to wonder if Pauling's offense had been to discuss openly the properties of a substance that threatens the profitability of medicine. " THE PAULING/RATH THEORY AGREES WITH THE LATEST SCIENTIFIC FINDINGS ABOUT CHOLESTEROL AND LP(a), IT WAS DEVISED BY A NOBEL PRIZE WINNER, YET IGNORED. THE VITAMIN C AND LYSINE THERAPY IS NON TOXIC, THE ONLY PROPER ADVICE IS TO RECOMMEND THIS THERAPY TO HEART PATIENTS, IN CASE IT DOES WORK, UNLESS AND UNTIL IT HAS BEEN PROVEN NOT TO. ANY OTHER COURSE OF ACTION RISKS SERIOUS ILLNESS, INJURY AND DEATH. This page was written THE THEORY HAS NEVER BEEN INDEPENDENTLY TESTED. SO NO ONE KNOWS FOR SURE WHETHER PAULING'S PROTOCOL DOES OR DOESN'T WORK IN HUMANS. and is maintained by Owen R. Fonorow and M. S. Till, Sr., (c) copyright 1995. These pages bear the fruit of medical science. We share our understanding of a new non-prescription treatment for heart disease. This discovery is based on at least 2 Nobel Prizes in Medicine and on the efforts of countless medical researchers. The theory and conclusions are the final contribution of a true scientific giant. That you have not heard about this discovery in the mainstream media is deeply disturbing. It speaks volumes that powerful interests can somehow suppress vital information detrimental to their financial interests. There is hope. The efficacy of Pauling's therapy has become obvious and this knowledge is spreading rapidly. If you suffer heart disease, you should be grateful for the Internet. If the Pauling Therapy can work for you, you should know within days. To our knowledge, all statements are factual and accurate. Please report any errors to mailto:Ticket@houston.rr.com. We offer a $100 reward to first person that finds a material factual error on this page. Note, minor spelling and grammatical errors are not considered material errors for purposes of this reward. The authors are the sole judge as to whether any reported errors are "material" to the subject matter. This material may be freely copied and distributed under the following conditions: A) the material is not changed or edited, B) entire pages are kept intact, and C) you include this copyright notice. The Linus Pauling Estate and Linus Pauling Institute of Science and Medicine are in no way connected with this page, nor do they benefit from the sale of any nutritional product mentioned on these pages. The Linus Pauling quotes not found on the video were taken from the last Pauling interview published in the British journal Optimum Nutrition, Vol 7 No. 3, Winter 1994, Patrick Holford, Editor. Copies of this interview are available upon request. The Institute of Optimum Nutrition is the copyright owner of the Linus Pauling Video on Heart Disease.